On June 17 we finally got our weather window. 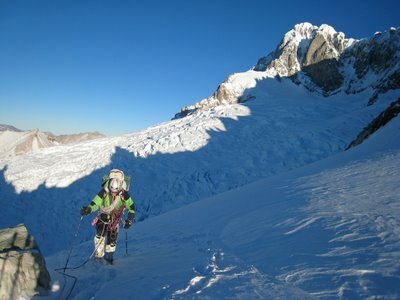 We took off from Puesto Muñoz early, got up to our advanced base camp where picked up our stuff and kept on going. 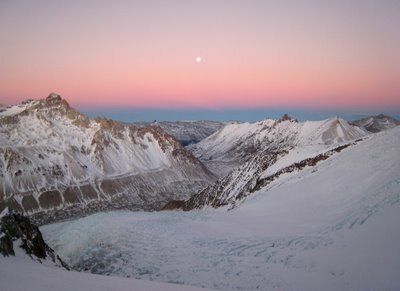 We walked along the North side of the upper lake and then climbed up the ravine towards the col as we had previously planned [read part 2 for details]. 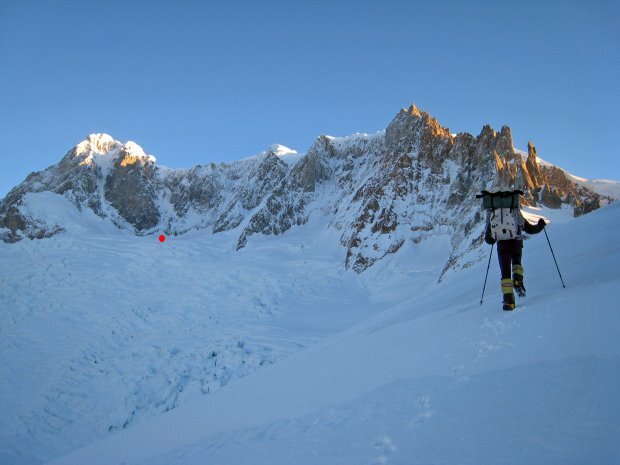 We were very excited to see the terrain on the other side of the col. Would it be possible to get on the glacier and would the glacier be passable??? Looking down from the col towards Carlos and the upper glacier lake. 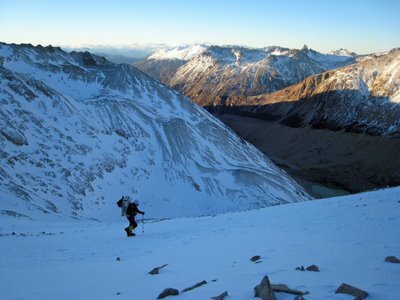 Carlos on the col walking towards a big plateau where we put up camp. North face of Cerro San Lorenzo on the left. Our route is in the corner between the North and East face above the red dot. We had ascended from 500 m (Puesto Muñoz) to 2000 m and the sun was setting. 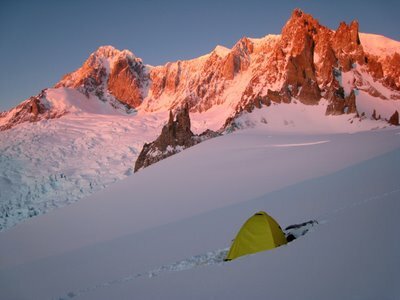 We thus put up our tent and crossed our fingers that the perfect weather would continue the next day where we hoped to reach the base of our route. Panorama video from the col.
Our camp on the plateau with an excellent view of the North & East face of Cerro San Lorenzo. Looking South from our camp towards El Rincón and the moon. The next morning we woke up to another day of perfect weather and a stunning view of the North/East face of Cerro San Lorenzo. Our line looked awesome - now we just had to get there, which meant approximately 2-3 km horizontal and 750 meter vertical approach. 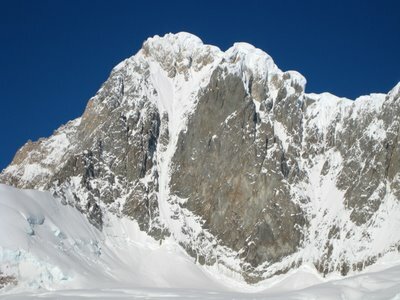 Close-up of the North face of Cerro San Lorenzo. 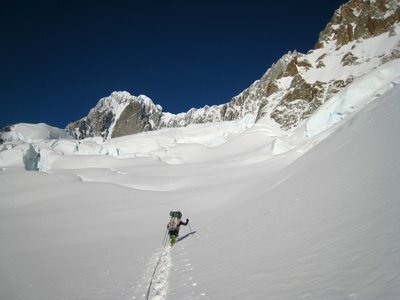 The big couloir in the middle has previously been climbed - our route was the couloir/ice line on the right. We roped up for glacier travel and started walking. Initially it was easy going as the plateau was wind blown, but as soon as we got close to the East face the snow got deep and fluffy. Easy going on the plateau. Eventually, the snow got so deep and unconsolidated that we walked in snow to the middle of our thighs. 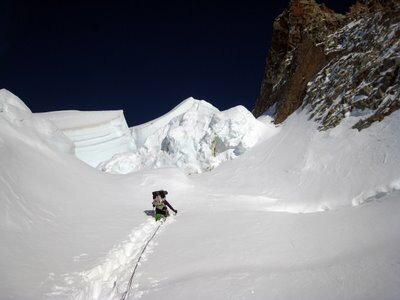 Carlos making tracks in thigh deep snow among seracs and deep crevasses. Not a fun place to be in! We had walked 1/4 of the distance to the route in 1/2 day and the snow was just getting deeper and deeper. We thus realized that it was pointless to continue towards the route. 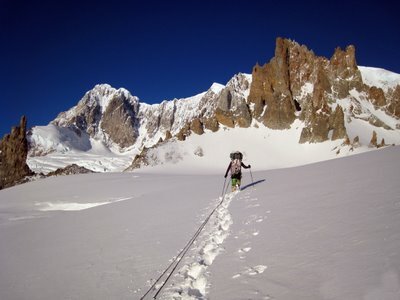 It would take us at least 2 days of very hard work to get to the base of the route, which would leave us with little food, gas and energy to climb the route and descent [we had brought 3-4 days of supplies]. Carlos taking two steps in 10 sec. Deep snow! At this point we thus decided to turn around and walk back to the plateau. What a disappointment! 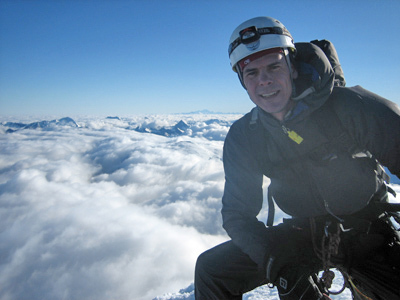 We had actually brought randonnee skies for this situation, but they were back in base camp and we didn't have time to go down and get them as we had to leave for Buenos Aires in a few days. We were completely surprised by the large amount of snow on the upper glacier as there was hardly any snow further down the mountain. However, we later rationalized this peculiar phenomenon as follows: the wind always blew from West to East and thus blew the snow over the large East face where the snow would then accumulate at its base. Thus, albeit there had been only little snowfall this season it had all accumulated on our approach route! A disappointed Carlos climbing back to the plateau camp with the heavily broken glacier and the North face of Cerro San Lorenzo in the background. 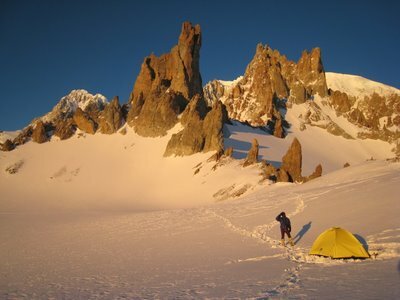 However, we didn't give up that easy and thus started looking for other objectives close to our camp on the plateau. 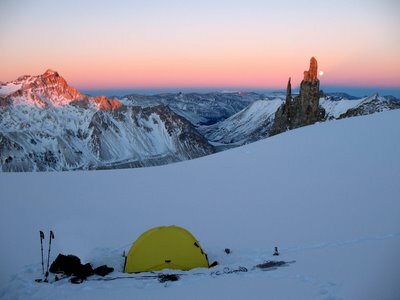 Lots of rock needles surrounded our camp, screaming for first ascents!!! Read the next part of the story: Cerro San Lorenzo part 5 - ascent of Aguja de Rune. 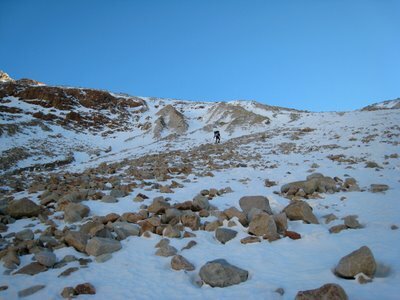 Read part 1: Cerro San Lorenzo - getting there. Read part 2: Cerro San Lorenzo - advanced base camp. Read part 3: Cerro San Lorenzo - life at Puesto Muñoz.